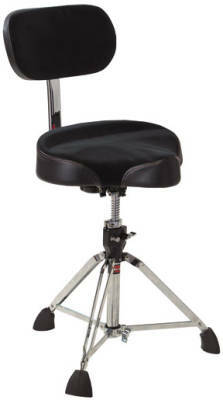 I bought this drum throne mostly for the cloth top, after trying it i really like the motorcycle style seat, with the cloth top i find i don't get as sweaty, i wasn't sure i would like the back rest, but know that i have it i kind of like it, i am very pleased with this drum throne, excellent quality and comfort. I bought this throne a few weeks ago because my back was hurting when I was practicing guitar on an old kitchen chair with no arms. This is such an improvement. I can practice and play for a few hours at a time. I like it so much I'm using it as my chair in my home office.